BACKGROUND AND PURPOSE: The pathophysiology of IIH remains unknown. TS stenoses have been observed in a high proportion of these patients. 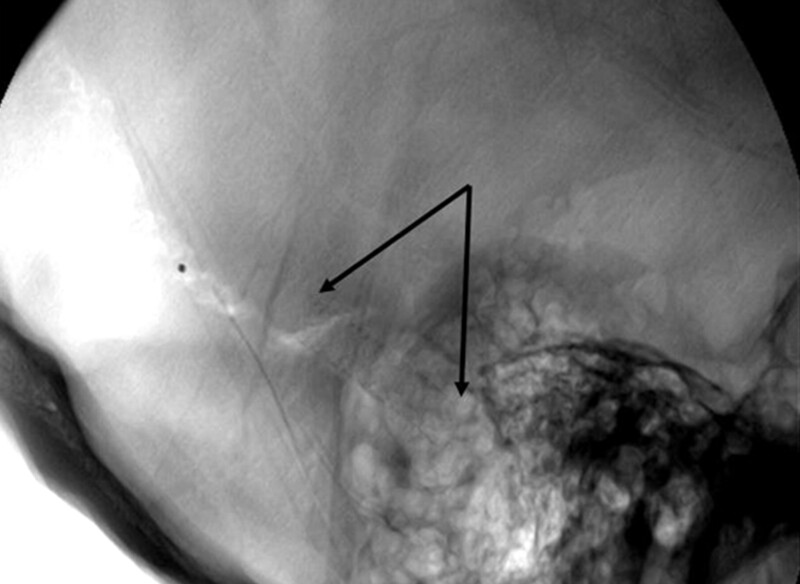 Stent placement to remove this potential obstruction to venous outflow has been proposed as a treatment option for patients with IIH refractory to medical treatment. MATERIALS AND METHODS: The clinical presentation, treatment, and outcome of patients with refractory IIH evaluated for venous sinus stent placement at a tertiary care center was retrospectively reviewed. RESULTS: Thirteen female patients with IIH were evaluated for sinovenous stent placement. Moderate sinus stenoses with normal intrasinus pressures were found in 3 patients and therefore stent placement was not performed. Ten patients had elevated intrasinus pressures (pressure gradient across stenosis, 11–50 mm Hg), which decreased following unilateral TS stent placement. Headaches improved or resolved in all stented patients. Papilledema resolved completely or almost completely in 8 patients and significantly improved in 2 patients. One patient developed optic atrophy. There were no major periprocedural complications. CONCLUSIONS: In this small case series, restoring the patency of stenotic venous sinuses with a stent in patients with refractory IIH resulted in symptomatic improvement in all treated patients. The safety and efficacy of this procedure should be evaluated in a randomized controlled study to determine its role within the armamentarium of therapeutic options for patients with IIH. The pathophysiology of raised intracranial pressure in IIH remains unclear.1–4 Various mechanisms have been proposed, including excess CSF production, impaired CSF absorption, or increased cerebral venous pressure. More recently it has been recognized that a high proportion of patients with IIH have uni- or bilateral TS stenosis (Fig 1).11,12 There is significant debate, however, about whether these sinovenous stenoses play a role in the pathophysiology of this condition or are simply a consequence of raised intracranial pressure.13–18 Restoring the patency of the stenotic venous sinus with stent placement can normalize intracranial pressure and significantly improve or render some patients asymptomatic.14,19–27 We report the clinical presentation and outcome of a series of patients with IIH considered for TS stent placement. Time-of-flight MR venogram of patient 9. Arrows indicate location of bilateral severe TS stenosis. The patients were all female ranging from 16 to 65 years of age (median age, 34 years) with a mean body mass index of 35.9 kg/m2 (range, 27.2–47.4 kg/m2). All patients suffered from headaches, most had visual symptoms (10/13), and pulsatile tinnitus was present in 3 out of 13 patients. Symptom duration before the procedure ranged from 2 weeks to >15 years. Two patients (patients 7 and 12) presented with a rapidly progressive course and were considered for stent placement within 1 month of symptom onset. All but 1 patient (patient 6) had active papilledema, with moderate or marked swelling noted in 9 patients (69%). Visual fields were significantly affected in 4 patients (31%). A recent lumbar puncture documented elevated CSF pressure in all patients ranging from 25 to 50 cm of water. MR imaging of the brain and time-of-flight venography were performed to exclude a mass lesion, hydrocephalus, or venous sinus thrombosis and to assess the TSs for stenoses. The severity of sinovenous stenoses was assessed by a neuroradiologist (D.P.) 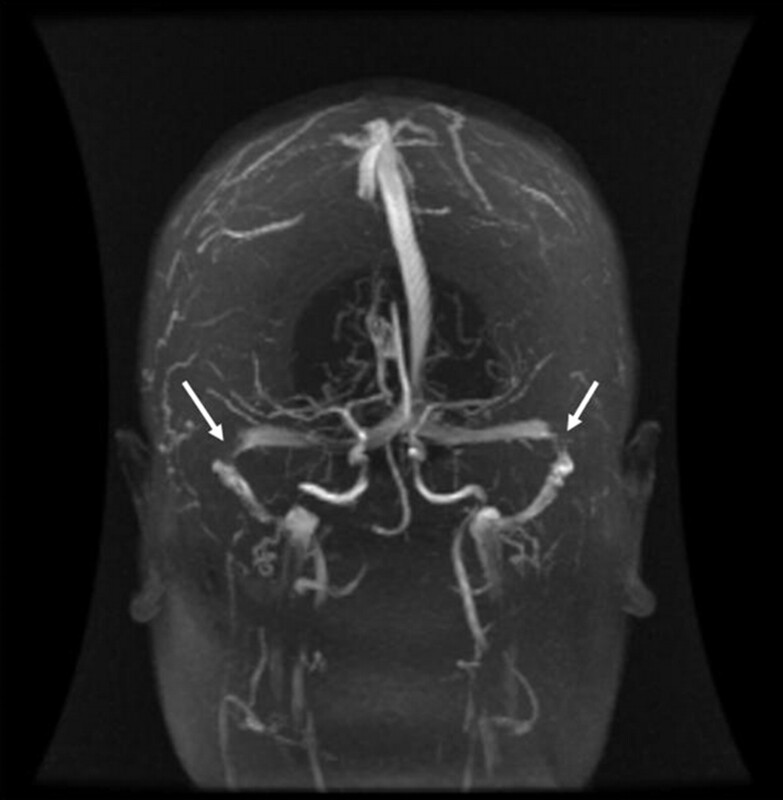 and graded according to the venous conduit score of Farb et al.11 Briefly, the grade was defined by the highest degree of stenosis on axial source images or maximum intensity projection images encountered from the torcula to the distal sigmoid sinus and given a corresponding number from 0 to 4. A score of 0 represented a discontinuity (gap) or aplastic segment; 1 represented hypoplasia or severe stenosis (>75% narrowing relative to the diameter of the lumen of the distal superior sagittal sinus); 2, moderate narrowing (50%–75%); 3, mild narrowing (25%–50%); and a score of 4 represented no or very mild narrowing (<25%). Unilateral moderate to severe TS stenosis was observed in 4 patients, and bilateral stenoses were seen in 9 patients. One patient had a TS stenosis and a contralateral severe stenosis at the sigmoid-internal jugular junction (patient 10). Patients received maximally tolerated acetazolamide with daily doses ranging from 0.5 to 2 g. One patient (patient 2) received a course of steroids and another patient (patient 4) was concurrently taking topiramate. None of these patients had yet been treated with optic nerve sheath fenestration, shunt surgery, or subtemporal decompression. Three patients were receiving long-term anticoagulation due to a history of thrombophilia and deep venous thrombosis. Two of these patients had antiphospholipid antibodies (patients 2 and 12) and 1 harbored the factor V Leiden mutation (patient 1). All patients were assessed by anesthesia for suitability to undergo general anesthesia. Enteric-coated acetylsalisylic acid 81 mg daily and clopidogrel 75 mg daily were prescribed for 5 days before the stent placement procedure. The 3 patients with a history of thrombophilia were anticoagulated before the procedure and received single agent antiplatelet therapy. The procedure was performed under general anesthesia with systemic anticoagulation by using intravenous heparin administered to maintain an activated clotting time of more than twice the normal level. Femoral venous access was obtained and a guiding catheter positioned into the right or left jugular bulb. A high-flow microcatheter was navigated into the superior sagittal sinus with the support of a microwire. Venography was performed by selective contrast injections in the TSs through the microcatheter to confirm the presence and location of stenoses. Using a pressure transducer attached to the microcatheter referenced to 0 at the level of the midaxillary line, intrasinus pressure measurements (manometry) were obtained. TS stent placement was performed only when a TS stenosis was associated with an abrupt pressure gradient of at least 10 mm Hg. This threshold pressure gradient was chosen because it significantly exceeds the normal gradual drop in intrasinus pressure of up to 5–6 mm Hg from the superior sagittal sinus to the internal jugular bulb.30,31 In patients with bilateral stenoses, the stenosis associated with the most significant gradient was selected for stent placement. 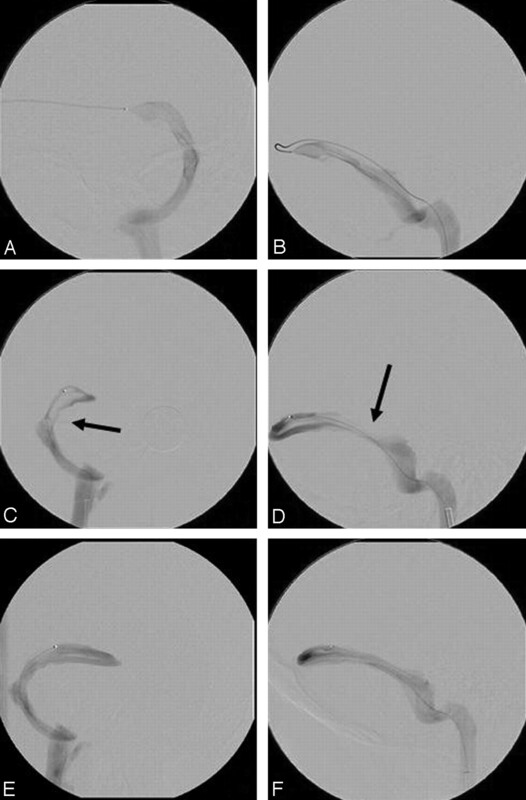 After deployment of a balloon-expandable or self-expanding stent across the stenosis, sized to the normal adjacent sinus diameter, venography and manometry were repeated when possible. For illustration purposes, venograms obtained during the stent placement procedure for patient 9 are shown in Figs 2 and 3. Venography, manometry, and right TS stent placement of patient 9. A, C, and E, Anteroposterior projection; B, D, and F, lateral projection. A and B represent venograms of the left TS, demonstrating no significant stenosis. Intrasinus manometry demonstrated a very gradual decline in pressure from 24 mmHg at the torcula to 13 mmHg at the sigmoid sinus. C and D represent venograms of the right TS with arrows indicating the stenosis. Intrasinus manometry demonstrated an abrupt pressure drop in the lateral TS at the stenosis from 25 to 14 mm Hg. E and F represent venography after stent placement of the right TS stenosis. Manometry no longer demonstrated a significant pressure drop with pressure of 17 to 15 mm Hg above and below the stent. Lateral skull x-ray of patient 9. Arrows outline the stent in the right TS. Patients were carefully monitored overnight and discharged home the following day. Patients were maintained on dual antiplatelet therapy for 3 months after stent placement followed by clopidogrel discontinuation. Oral anticoagulation was maintained in the 3 patients with known thrombophilia. Follow-up venography to confirm stent patency was not performed routinely. Detailed ophthalmologic examinations were performed before and after stent placement. Papilledema was graded as not present, acute active, chronic active, or chronic gliotic and severity was graded according to the Frisén scale.32 Visual fields were assessed by manual kinetic Goldman perimetry and graded according to the scale of Shah et al.6 In brief, grade 0 represented no visual field defect. Grade 1 represented a nerve fiber layer type visual field defect with a normal 12e isopter encompassing the blind spot and the central visual field. Grade 2 represented constriction of the 12e isopter (without absence) that did not encompass the blind spot and central area completely, with total visual field >20°. Grade 3 represented absence of the 12e isopter in the central area with total central visual field >20°, and grade 4 a total visual field <20°. Transfemoral access to the intracranial sinuses for pressure measurements was successful in 12 of 13 patients (92%). In 1 patient (patient 13), the internal jugular veins could not be cannulated by using this approach and therefore a direct puncture of the right internal jugular vein was performed during the same procedure. A significant pressure gradient (>10 mm Hg) across stenoses in the TS was observed in 10 of 13 patients (Table 1). TS stent placement was performed in these 10 patients. Nine of 10 TS stenoses were successfully stented via a femoral approach. In 1 patient (patient 12), a stent could not be advanced beyond the sigmoid-jugular junction due to vessel tortuosity. This patient had presented with fulminant IIH and rapidly progressive visual loss. A lumbar drain was used as a temporizing measure to control intracranial pressure. Stent placement was then performed via a left temporo-occipital craniectomy to access the TS by using image guidance and transfemoral cerebral venography to accurately position the burr hole and stent. Pressure gradients across the stent decreased in all patients where intrasinus pressures were measured poststenting (Table 1). At 6 months or at longest follow-up, stented patients reported their headaches as either significantly improved (8/10) or completely resolved (2/10). Four patients had significant relief of their symptoms immediately after TS stent placement was performed. The remainder (6/10 patients) described a more gradual improvement in symptoms over 2–6 weeks. Papilledema resolved completely or almost completely in 8 patients and was noted to be significantly improved in 2 patients. One patient developed optic atrophy (patient 10). Visual acuity normalized or significantly improved in the 4 patients with impairment before stent placement (patients 1, 7, 10, and 12), though 1 patient had persistent significant visual loss associated with optic atrophy (patient 10). Interestingly, despite intrasinus pressures remaining elevated in 4 patients after stent placement (patients 5, 7, 8, and 10), 3 of these patients reported almost immediate relief of symptoms (patients 5, 7, and 8) and the fourth reported significant early improvement. There were no major periprocedural complications. Transient contrast extravasation was observed in 1 patient (patient 13) without development of significant intracranial hemorrhage and without clinical consequence. Two patients complained of transient mild headache ipsilateral to the stented sinus. There were no clinically obvious occurrences of stent thrombosis, though follow-up venography was not routinely performed. In the 3 patients where no significant pressure gradient (<10 mm Hg) was measured in the TSs (patients 3, 11, and 13), stent placement was not performed. One patient (patient 3) symptomatically improved on medical therapy alone. The second patient (patient 11) has remained stable but with persistent moderate-grade headaches and low-grade papilledema at 3 month follow-up. Ventriculoperitoneal shunt surgery was performed in the third patient (patient 13), which resulted in immediate improvement of headache and gradual improvement in papilledema during follow-up. Distal TS stenoses are observed in a high proportion of patients with IIH.11,12 Using 3D gadolinium-enhanced MR venography, bilateral sinovenous stenoses were seen in 27 of 29 patients with IIH but in only 4 of 59 controls.11 In another study, absence of segmental flow (flow gaps) in both TSs was seen in 13 of 20 patients with IIH but not observed in 40 healthy headache-free controls by using phase-contrast and time-of-flight MR venography.12 Consistent with these findings, direct intrasinus manometry has demonstrated elevated pressures in the superior sagittal and proximal TSs of patients with IIH, with a significant drop in venous pressures in the distal TS.30,31 Taken together, these data suggest that TS stenoses may play a role in the pathophysiology of IIH in some patients by causing partial venous outflow obstruction. It is well known that the clinical presentation of other conditions that cause cerebral venous outflow obstruction, such as venous sinus thrombosis, can mimic IIH. The etiology of lateral sinus stenoses in patients with IIH remains uncertain. Considerable congenital asymmetry between the TSs has been found in anatomic studies. The right lateral sinus is larger or dominant in up to 73% of cases, and partial or total agenesis of portions of a TS are observed in up to 23% of cases.33 The cortical vein of L'Abbé drains into the distal third of the TS, in addition to several smaller tributaries from the inferolateral temporal lobe, occipital lobe, and cerebellum.34 Arachnoid granulations are frequently seen in the lateral TS associated with these venous entry sites,35 and if large may be a cause of venous outflow obstruction.36 Large transversely oriented septations or fenestrations were present in 10% of TSs evaluated in 1 postmortem study and are postulated to be a cause of venographic cryptic stenosis.37 Incomplete recanalization after thrombosis of a TS may occur causing filling defects and sinus narrowing due to residual chronic organized (fibrosed) thrombus.38,39 There are also case reports of focal fatty deposits21 and heterotopic brain or small brain hernia21,40 causing TS obstruction. Other recent studies have suggested that the sinovenous stenoses seen in IIH may be manifestations of raised intracranial pressure. The Monro-Kellie hypothesis postulates that changes in CSF are in part compensated by changes in intracranial blood volume reflected primarily in the venous system.41 Raised intracranial pressure may therefore cause a collapse or extrinsic compression of the sinus walls. In agreement with this hypothesis, several authors have reported reversibility of lateral sinus stenoses by CSF removal or diversion procedures in patients with IIH.12,14–18 Using a lateral C1–2 puncture to remove 20–25 mL of CSF, King et al15 demonstrated resolution of venous hypertension measured by intrasinus manometry in patients with IIH. Normalization of venous sinus caliber on MR venography after lumbar puncture17 or subsequent to ventriculo- or lumboperitoneal shunt surgery13,14,16 has also been observed in selected patients with IIH. However, in a study by Bono et al,42 TS stenoses persisted after normalization of CSF pressure with acetazolamide and weight loss in 14 patients with IIH, suggesting either that some patients have fixed obstructions or that large acute shifts in CSF volume by lumbar puncture or CSF diversion procedures are required to produce changes in the caliber of sinuses. Three patients in the present case series were not found to have significantly elevated pressures in the TS. Time-of-flight MR venography was used to image the cerebral veins in these patients. It is possible that the severity of the stenoses was overestimated due to the insensitivity of this technique to in-plane flow or due to its sensitivity to slow flow or turbulence.39 Gadolinium-enhanced MR venography, which is not susceptible to in-plane saturation effects, may have resulted in more accurate estimation of sinus caliber11,39 and improved patient selection for possible stent placement. Alternatively, these patients may have lacked a significant pressure gradient because the visualized stenosis may not be contributing to the pathophysiology of their symptoms, perhaps due to sufficient venous collateral drainage. An increased incidence of prothrombotic factors or genetic thrombophilia has been recently described in patients with IIH.43–48 This association has led to the hypothesis that microthrombus formation in arachnoid villi may impair CSF outflow and thereby contribute to the pathogenesis of IIH.44,47,48 There is little evidence, however, to support this hypothesis. It has also been suggested that cranial venous outflow obstruction may occur due to unrecognized nonocclusive thrombus or due to incomplete recanalization of a previously occluded sinus.38,39,46 In the present series, headaches and papilledema improved in all 3 patients with a history of thrombophilia subsequent to restoration of the diameter of the stenotic TS with a stent. We acknowledge several limitations of this small retrospective case series. First, the clinical course of IIH is quite variable. It can be a subacute and remitting disorder or follow a more protracted course with delayed worsening occurring even years after a period of stability.6 Thus, although the response of this small group of patients to TS stent placement is encouraging, a true assessment of the efficacy and durability of any treatment for IIH would require a larger randomized controlled study. Second, weight fluctuations were not systematically recorded during follow-up. Weight loss on its own may result in clinical improvement in a proportion of patients with IIH. Third, the long-term risk of in-stent stenosis or delayed thrombosis of stents within dural venous sinuses in primarily young female patients is unknown. Although most patients with IIH improve with conservative therapy, an estimated 18%–22% of patients are considered refractory with visual impairment and/or headaches persisting or progressing despite maximally tolerated treatment with acetazolamide, furosemide, and dietary counseling for weight loss.49,50 Surgical procedures, such as optic nerve sheath fenestration, ventriculo- or lumboperitoneal shunt surgery, and subtemporal decompression are usually considered for such patients to prevent visual loss and treat intractable headaches. These procedures are not universally effective, however. Failure rates as high as 30% have been reported and complications are not infrequent.50–53 Venous sinus stent placement may be an alternative treatment option for patients with IIH refractory to medical therapy. The safety and efficacy of this procedure, however, should be evaluated in a larger randomized controlled study before it is applied more widely. In this small case series, restoring the patency of stenotic TSs with a stent in patients with refractory IIH resulted in resolution or significant improvement in headache and papilledema in all treated patients. The safety and efficacy of this procedure, however, should be evaluated in a larger randomized study before it is applied more widely. Drs. Andrew Leung, Donald Lee, Irene Gulka, and Stephen Lownie were involved in the venous sinus stent placement procedures at the London Health Sciences Centre. Accepted after revision August 17, 2009.